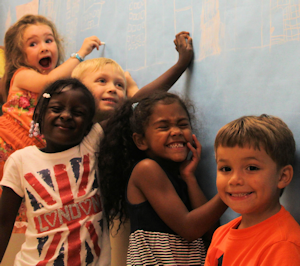 This Kids Creative Board of Directors is seeking new members! We are looking for a diverse group of individuals who are passionate about our mission of developing confident, community-minded youth through arts education programs in NYC. Everyone is invited to apply. To inquire about joining our Board of Directors, contact Executive Director Adam Jacobs at adam@kidscreative.org or (646) 485-5123. Kids Creative is a nonprofit organization that offers arts-based, peace education programs for Pre-K to High School age students through after school programs, summer camps and workshops. Our mission is to foster confidence, creativity, conflict resolution skills and a strong sense of community in children through arts education. • Committees include: Fundraising and Earned Income, Finance, Audit, and Board Development. Since running our first summer camp in 2000, Kids Creative has tripled in size, running award-winning after school, summer and workshop programs with thousands of children throughout the New York Metro area.